Soon after the National Assembly passed the Law on Foreign Investment in Vietnam in 1987, the country started witnessing Foreign Direct Investment inflows which have made considerable contributions to the national economy. 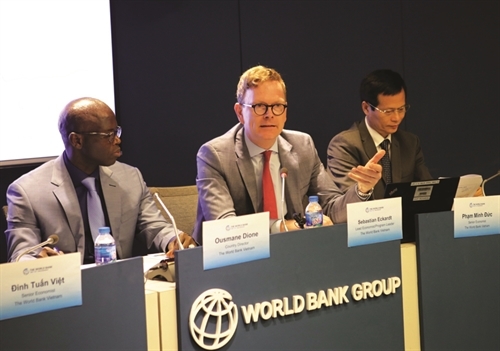 To mark the 30th year of Vietnam’s FDI attraction, Vietnam News Agency talked to Sebastian Eckardt, lead economist at the World Bank Vietnam. Could you please assess the general impacts of FDI on the Vietnamese economy over the last 30 years? Vietnam has been quite successful in attracting FDI ever since the country opened up to foreign investment, and if we look at the impacts, we can say that FDI has contributed in various ways, including industrialization, where a lot of investment went into the manufaturing sector, building capacity across a range of sectors, including electronics, but also more traditionalized industries such as garments and shoe factories, and so on. [The FDI flows] are really feeding Vietnam’s strong export performance and creating jobs with higher productivity and better paying jobs, directly and also indirectly, by then creating demand for services for construction, and even agricultural products that are used to supply some of these factories. So I think it’s a very successful part of Vietnam’s overall economic development over the last three decades. What do you think about Vietnam’s potential for FDI attraction compared to other countries in the region? Vietnam is definitely one of the leaders in the region. It has attracted FDI across a diversified set of economic activities. About 12,000 different firms are operating here, either producing or of course companies that are here to sell products to the Vietnamese market. So there are a lot of inflows and Vietnam has been quite a success. Now what is important to note though is that a lot of this investment is currently in labor intensive and relatively low skilled work, so Vietnam is competitive in one particular part of the value chain where the value added per worker is relatively low, because a lot of the components are imported, and Vietnam is only doing the final assembly. I think there is still an agenda in terms of moving to the next level of attracting different types of FDI, diversifying across the value chain and particularly moving into higher value component of the value chain, be it R&D or downstream like marketing and brand development. That would add a lot more value and would generate higher benefits to the economy of Vietnam. Over the last 30 years, Vietnam has improved its business environment in order to attract more foreign investment. How do you assess the results achieved from this and please analyse the challenges that Vietnam is facing on this matter? If we look at the ingredients Vietnam has been successful with so far we can say that there are some natural advantages. Geographic location, and as I mentioned, the population. What Vietnam has done quite well is capitalizing on those fundamental advantages and opening up to trade, joining the WTO and coming into several multi and bilateral trade agreements; more agreements than any other economies in East Asia except for Singapore, so Vietnam is really one of the most open economies. At the same time Vietnam has focused on the investment and business environment by reducing hurdles to investment, lowering taxes and improving border and customs clearance procedures, and so on. The Government has made it a clear priority to cut red tape, to streamline procedures and to get rid of those procedures that may not be needed. Countries are facing constraints such as transfer pricing, tax evasion and even negative environmental impacts when it comes to attracting FDI. How should we resolve this? For that you need smart regulations so I think that’s absolutely correct to have an expanding economy that is increasingly sophisticated and has a lot of financial and real interaction with the outside world. That poses a challenge and requires regulations to be adapted, for example, as you mentioned transfer pricing we know is an issue for multinational operations that invest a lot. It’s important that you have a good leadership framework to tackle all those issues, so it’s predictable for firms on the one hand but also empowering the authorities to prevent tax avoidance or profit shifting. You need to create a level of playing field between those enterprises and domestic firm so you need a good legal regulatory framework and good capacity in tax service. What we see in many countries are basically specialized offices in the tax service that deal with large enterprises that need very sophisticated analysis to ensure they pay their due share to the tax system here in Vietnam. The world economy is entering the fourth Industrial Revolution and like some other countries, Vietnam is looking forward to attracting top foreign investors in the IT sector. In your opinion, what should we do to complete this mission? The 4th Industrial Revolution is widely seen as impacting some of the industries in which Vietnam has traditionally been quite successful and I think there are concern not only here in Vietnam but more generally that technology will modernise manufacturing and basically make some labour intensive manufacturing redundant. There are some risks in terms of jobs so I think Vietnam needs to invest in skills. We know that technological progress is of course a good thing, and I think there is a good reason to be optimistic that the IR4, like the other industrial revolutions, will actually improve the lives of millions of people. But it is important to prepare people with the right skills so they can find jobs and productive employment that complement these technologies rather than compete with technology. I think investing in good education, especially science-technology and maths is important because those are really the skills that I think will be in demand in the future so Vietnam needs to continue that and really make sure it has the human capital that remains competitive as technology changes the way things are produced, how services are delivered. Could you tell us how developed countries attract more FDI and utilize it, and the challenges that FDI companies are facing in Vietnam. In many developing countries you see similar things happening with the FDI sector often operating quite independently from the rest of the economy. That’s because there’re specific policies to attract those enterprises with specific privileges and incentives I specify special economic zones, and they never really connect with domestic enterprises. That’s very different if you look at developed countries where you see they become part of the broader economic organism of the country and I think that’s also clearly the challenge for Vietnam to ensure that these enterprises here connect more and build supply chains here in Vietnam and linking domestic firms.